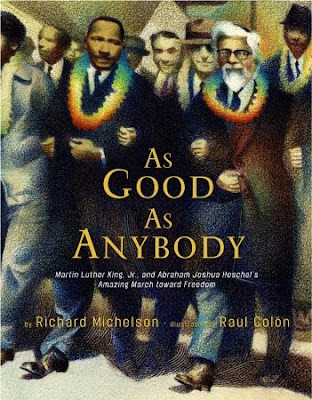 Here's a new book for Martin Luther King Day: As Good As Anybody, Written by Richard Michelson and illustrated by Raul Colon. Michelson fluently connects two religious leaders who fought for social justice: Dr. Martin Luther King, Jr. and Rabbi Abraham Joshua Heschel, who fled from Poland to America shortly before the Holocaust, and later became a part of the civil rights movement. Both the text and the art (Colon paints earthy colors for Dr.King's life and blue hues for Rabbi Heschel's) draw parallels between the lives of these two men. Both experienced hatred and racial discrimination, both were taught they were "Just as good as anybody," and both followed in their father's footsteps to become religious leaders. These two parallel lines merged when they walked together in the famous 1965 Freedom March from Selma to Montgomery, Alabama. How people can transcend their differences and work in harmony towards justice is tastefully shown in this handsome book. Thanks for the rec, it looks like a worthwhile book! "As Good As Anybody: Martin Luther King and Abraham Joshua Heschel's Amazing March Toward Freedom," was awarded the prestigious Sydney Taylor Award Gold Medal from the Association of Jewish Libraries. Look for me to make a new post tomorrow!